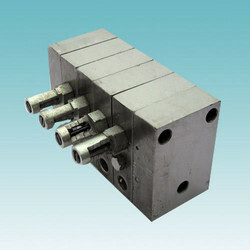 Pioneers in the industry, we offer adjustable progressive distributor block from India. Systematrix Engg Services are proud manufacturer of Lubrisys Adjustable Distributor Blocks / Divider Valves. The construction of the Progressive Distributor Blocks are such that the flow out of one point is dependent on the other which makes it difficult to design adjustable flow Distributor Blocks. After a lot of research, we have successfully developed an adjustable Distributor Block /Divider Valves which gives the user the freedom to design, install and operate the lubrication system with more flexibility and ease. This new development in the field of lubrication system will make it possible to maintain less inventory, and it’s flexibility is most useful when the flow requirement is not known until installation. Looking for Adjustable Progressive Distributor Block ?